When people ask why I got into broadcasting, I always have the same answer. "I don't know. It's all I ever wanted to do." I was always playing with a radio when I was a kid — not really for the music, but to listen to the news, the DJs and the jingles and the presentation. I never discussed career goals growing up because trying to get a job in broadcasting didn't seem like a thing normal people did. It seemed unattainable. My tastes refined a bit as I hit my teens. I gravitated toward news. My classmates were out doing kid things in the afternoon and evening. I was watching TV. I entered Marywood College, now Marywood University, in 1979. Freshmen weren't allowed on the air of the college radio station, WVMW-FM, but I weaseled my way into an all night shift for one night in December of 1979. I was hooked. The college had, and still has, a small cable television station. I did some work with that, but most of my media work during my college years was with the radio station. My first real job came along in April of 1981. WARM-AM 590 was looking for someone to run the religion and public affairs shows on Sunday mornings. There wasn't much to do. Put a tape on a machine. Press "play." Do the same thing a half hour later. WARM-AM was my station of choice growing up, so even having the lowest job here was a thrill. I got my break several months later, when the disc jockey misread the schedule and didn't show up at 9 a.m. to do his live show. It was a snowy morning. The audience expected information. I had some on-air experience at WVMW-FM, so I did the first hour of the show. I expected to get in trouble. It didn't happen and I started getting more on-air assignments. For my first few years at WARM-AM, I was the swing man — a disc jockey when they needed one, a news reporter and anchor when the need arose. I eventually switched to news, full time, after graduation. For a few years, I had the greatest job in the world —traveling about the area in my news car, armed with my cassette recorder, careening from courts to fires, to crimes, to features. I was on the road full time and I loved it. Eventually, as people left and formats changed, I did less reporting and more anchoring. By the time I left, I was one of the morning news anchors, the station's highest rated time period. 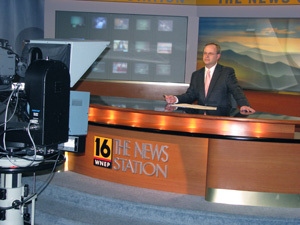 There were several awards from the Associated Press and the Pennsylvania Association of Broadcasters. By the time 1990 rolled around, I felt the need to expand my reach. It started with a part time job at WYOU-TV, the CBS affiliate in Scranton. Part time weekend work led to a full time job in 1991. I loved radio, but I woke up one morning and realized there was nothing left to do at WARM-AM. Most of the WYOU-TV years were spent reporting — but I was also fill-in anchor, plus had assignments at parades and I was the side line reporter on the station's High School Football Game of the Week. WYOU-TV and I parted company after the station was sold in 1996. It was followed by a reporter's job at WBRE-TV, plus freelance work for WPMT-TV in York, Pa. and WYDC-TV in Corning, N.Y. 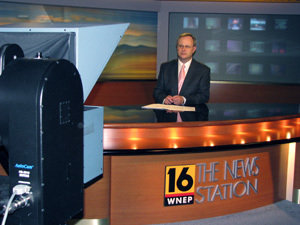 I joined WNEP-TV as producer of the weekend morning news and assignment editor in June of 1998. I was switched to anchor of the weekend morning broadcasts in Septmber of 1999. I became producer and anchor in September of 2001. In addition to the weekend morning broadcasts, I'm one of the "live" reporters for Newswatch 16 This Morning, one of the highest rated morning news broadcasts in the nation. I can't say there were any major influences on my style and career. I like to think I've picked up a little something from everyone I've worked for and with, especially the photographers. When I'm off duty, hobbies include non fiction books, computers, and long walks. Copyright © 2014-2017 Andy Palumbo. All rights reserved.